Two simple questions that are most likely to be asked by the person sitting across from you on your first date, but how honestly do you answer them? Last week Olivia asked: “what are you afraid of?” – but she wanted you to answer this question truthfully, because lets get serious your biggest fear is probably not the dark anymore. Responding to this question can be difficult. It wakes you up. It makes your vulnerable. It may scare you. I know it scares me. 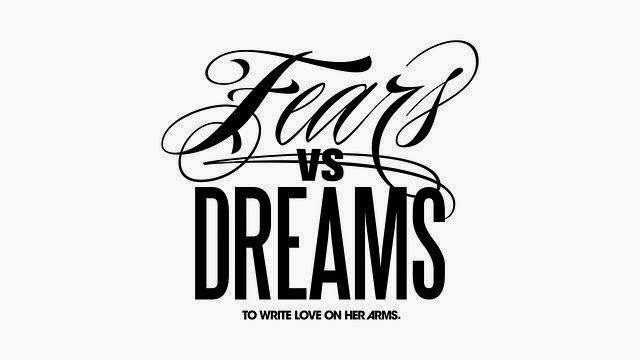 The organization To Write Love On Her Arms started a campaign called Fears Vs. Dreams. It’s a very straightforward idea. You write down what your biggest fear is and underneath that you write you biggest dream. When you take a step back and look at what you wrote you might find that you biggest fear and your biggest dream are connected. If you visit their website you might also find that you aren’t alone. Our fears hold us back a lot and it is our dreams that drive us. So, how do we overcome our fears and leap for our dreams? I think writing them down is a good place to start. You have the opportunity to see the connection this way and it is quite eye opening. Being open and honest with people about your biggest fears and your biggest dreams is the next step. Talking about them is not an easy task, but by recognizing them and conversing about them you can deal with the fears and jump for the dreams. Personally, I have a week until I begin my final year as a student affairs graduate student. I am terrified, but excited for a lot of reasons. One of my biggest fears for the year, as well as life in general, is failure, but my biggest dream is success. They are both broad, but I can break them down to failing my comprehensive exam, not finding a job etc / passing my comprehensive exam and finding a job. The only way to achieve my biggest dreams is to face my biggest fears. For some of you the academic year has begun, but it is never too late for some personal assessment. Write down your biggest fears for the year and your biggest dreams. What can you do to overcome your fears and what can you do to achieve your biggest dream? "The only way to achieve my biggest dreams is to face my biggest fears." you're awesome! keep doing what you are doing!!!! stay strong, follow your dreams, face your fears and NOTHING can stop! SEEKING INFO ON ALL THINGS HESA. HELP!